Over the last few weeks there have been several instances where the subject of of “I just can’t seem to do anything creative” has come up. I’ve heard it in discussions, read it in blog posts and experienced the frustration first hand with friends and family members who felt that they should be more creatively “productive”...but it just wasn’t happening for them. You know what? It’s OK. I really believe that although we are all creative beings, our our ebb and flow isn’t always switched on to “fabulous” or “produce” mode 24/7. Why people continue to beat themselves up with the false belief that it should be, is just silly. 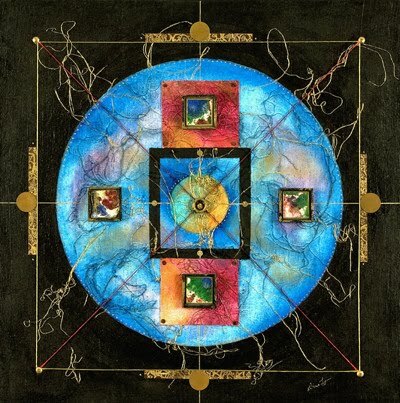 It wasn’t, I’ll admit, until I started working so closely with circle imagery (the mandala form) in my artwork that I came to fully understand and appreciate this concept. Everything really does have a beginning, middle and end...and a lot of “in-between”. Whether it be a person’s life cycle, making art, or taking a trip the to grocery store... the same order of process applies. Metaphorically speaking... we all dance around the circle, around the circle, around the circle....and when there is a pause, we are not always positioned at the top. It’s how we handle the “non top times” that matter in our lives. Are we frustrated? Do we shower that frustration on to others and as a result bring their spirits down too? Or are we a little more wu-wei about it and just move away quietly to something else, mentally switching gears and changing our approach? From an artistic standpoint I learned a long time ago to not fight my creative lows, and I’m much more centered and content as a result. If a painting just isn’t “coming”...I don’t struggle with it, but move on to something else related to my artwork or jewelry business. A task more mundane seems to always works well for me. It shifts my mind from thinking and feeling to a physical, doable chore. Stretching and gessoing canvases, for example, has always proved to be a very workable solution. I have to make them anyway... Might as well stretch, staple and gesso...and not think. It works wonders. If I’m designing jewelry and it’s not going right....I paint. Or I clean my studio, list items on the computer or cook. If I’m “stuck” and don’t feel very inspired... weeding through the multitude of “stuff” in my studio also works it's magic on me. Looking through items that you have saved, or even old artwork, can be an amazing creative trigger. Whatever your personal “artistic slump” solution may be, the important thing is that you have one. Learn to recognize when your flow is about to stall, and understand that it is a normal part of life and the creative process. Use this time to explore other artistic options, don’t take your frustration or sullen mood out on others, and switch your routine up a little. When your circle dance picks up again, you’ll find yourself in a very satisfying new place. From time to time, I perform blog searches related to Taoist terminology to see who is discussing what. This is how I happened here right now. Just wanted to say that this is a very insightful post. I think you captured the essence of wu wei very well. Thank you! This is very insightful and timely for me. I have many ebbs and flows, for reasons that don't always have to do with my artisticness. Remembering your words and insights will help alot!